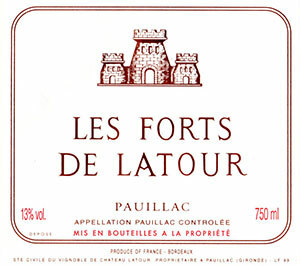 The 2003 Les Forts de la Tour possesses a dense ruby/plum/purple color in addition to notions of cold steel, lead pencil shavings, and creme de cassis. Full-bodied, opulent, heady, rich, and lush, it can be drunk now or cellared for 15+ years. Tasted at Bordeaux Index’s “10-Year On” tasting in London. The 2003 Les Forts de Latour has a classy bouquet that is very well defined: graphite infused black fruit that offers wonderful focus. The palate is medium-bodied with fine tannins, plenty of pure black fruit mingling with pencil shavings and cedar. The finish has a sweet supple, pastille-like generosity that makes this a very appealing Les Forts. A Grand Vin in all but name. Tasted March 2013.